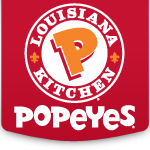 The Popeyes® brand was founded in New Orleans, Louisiana in 1972 and is the world’s second largest quick-service chicken concept (based on the number of units). Within the QSR industry, Popeyes distinguishes itself with a unique “New Orleans” style menu that features spicy chicken, chicken tenders, fried shrimp and other seafood, as well as jambalaya, Red Beans and Rice and other regional items. Popeyes has a passion for its Louisiana heritage and flavorful authentic food.